Maketu Sea Magic "Bach Retreat" is just that- a great feel, somewhere to totally relax and chill out, with everything you need to make your stay comfortable. 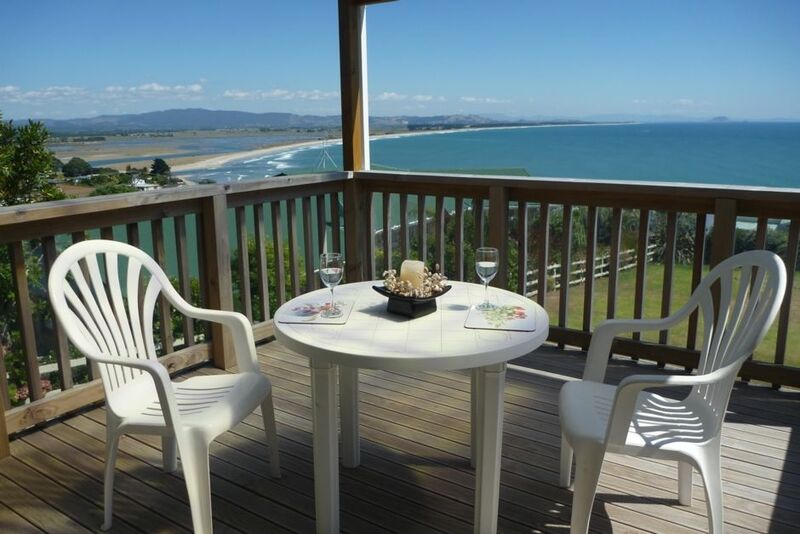 On any day the Views are mismerizing, breathtakingly, magnificant seaviews from Motiti Island to Mount Mauganui and beyond and By Night dazzling beautiful lights of Tauranga and Gorgeous Sunsets to dazzel you eyes. PAENGAROA ;has 2 Restaurants, / cafes, The " Funky Lizard "does have BYO wine and music sometimes on a Friday and Sunday. There is a fuel station, and a Small superette. ; The world famous" Comvita Honey Products".with shop,/cafe. TE PUKE;, there is heaps of Takeaways and Restaurant plus Clubs .RSA and Te Puke Citizen. also the Irish Pub (Mollyes) . also, close by is KAITUNA RIVER JET HELICOPTER TOURS featuring tours , helicoptor rides and much more..
ROTARY CLUB MAKETU has a very friendy club meeting on a Wednesday evening at the Maketu Surf Club . Maketu Markets are held the 3rd and 5th Sunday of the Month. ( sometimes in winter market Days change). Held on Village Green. Maketu Kaimoana Festival in Feb or March normally. Relax and enjoy this Modern Bach. Visitors to leave property by 10.00pm as in respect to neighbours.
. PEAK TIME The deal stay 6 nights pay for 5 does not apply . Hi ... Welcome to my Page I am Carol. I have my own Business Harmony Health and Healing, offering a variety of services, I am Also a Access Bars Facilitator and Natural Facelift . I have a great caring for what I do and the people . My property at Maketu is an extension of that I love making it nice for others comfort. I also love to go away in Our Caravan, go fishing at the lakes near Rotorua. with my Partner Dave I have 3 sons and 6 Grandchildren. who give lots of pleasure. What would it take for You to Choose Me? What would it take for you to Bring Your loved ones with You to Enjoy this Special Place high up overlooking the ever changing scenery and Energy of the Ocean and and Magnificant Sunsets and the Magic of the Lights in the Evening. How does it get Better and what else is Possible? Maketu is awesome that there are actually 3 beach areas very close by from property. there is Newdicks Beach , Maketu Beach and Estury, and Little Waihi. All within walking distance or 5min car . The Ocean View is amazingly awesome, if calm you can see Coromandal on clear day, At Night you see the beautiful lights of the Mount Maunganui, If rough weather, waves are exciting & Mizmarizing. Kitchen Dining is Open Plan allowing space.Great size Breakfast Bar seating 5 or 6 Dining Table seats 4 and extends for extra room. Deck Table seat 4 Deck Tables include BBQ table on Lover Deck. Very Welcome to come again. Everything left nice and tidy. Stunning outlook and the local information Carol left in the house proved very useful. Stunning outlook and the local information Carol left in the house proved very useful. We were able to fit in a couple of fabulous local walks during our stay. Would recommend as a lovely getaway. This cottage feels like a home which is very nice. This cottage feels like a home which is very nice. Loved the new deck facing out to the sun and ocean, a spot for many cups of tea! Thankyou for Both responses, I am not sure what happens to the other lovely comment you made, or where that ends up. Who gets to see the first comment you made.? Thankyou again, Much appreciated. Thankyou for your kind comments, It was a pleasure to have you stay and you are welcome again. Nice cottage, fantastic views. Got really windy on the hill. Rest and Relax on the Deck overllooking Paradise, Fish n Chips on the Beach ... or Go Fishing, Surf casting, Boating or gathering a few pipis. Surfing: Wind Surfing, Bike Riding, Maketu Wetlands Loop Track , Beautiful Historic Walks. Beach Walks . : Magic Sunsets. Golfing. or simply a Coffee or Meal at the Cafe. Maketu is close distance to Whakatane, Rotorua Hamilton. a Great place to meet for families.